No sign of Blu-ray player, but do you care? While most consumers have happily forgotten about Google TV, Sony still remembers as its latest Network Media Player based on the service is now available to pre-order. Sony's NSZ-GS7 is a $200 set top box, which should make it more attractive than the company's less successful attempts to bundle Google TV with a television set directly. It includes a unique remote with QWERTY keyboard on one side and a touchpad with controls on the other for web and TV navigation. The remote also features an accelerometer to making it compatible with more Android apps and a microphone for voice control or Skype calls. 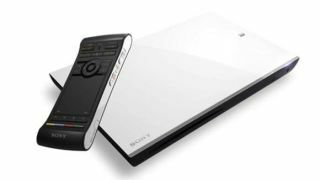 Sony announced the NSZ-GS7 Network Media Player earlier this year at CES 2012 as part of a pair. The second device featured at CES was a Blu-ray player, the NSZ-GP9, which also included Google TV integration and the same intuitive remote. During CES, we found that the remote made for a much better Google TV experience than the poorly received Revue box. The NSZ-GS7 Network Media Player is currently up for pre-order through J&R, though no release date has been set.